As we make our (what seems to be flying by) way through the cold and wet days of 2018, I find myself stuck musically in 2017. I don’t know about you, but I can’t seem to let go of some of the most catchy pop-punk albums of last year. Last year was a good year for the pop-punk genre. Although there were many great hits last year, The Peace and the Panic and Feel Something stood out the most for me. Pop-punk might make you think about pizza, friends, and your hometown but my favourite part of the genre is it makes you feel more gratitude towards old heartbreak, as soon as your heart is broken these what-seem-to-be-hardest times of your youthful and angsty life have a different way of sitting with you. 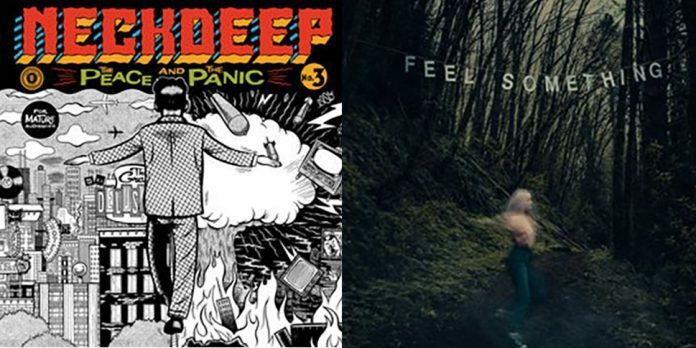 The five-man Welsh band is back for their fifth album The Peace and the Panic by Neck Deep was released on Aug. 18, 2017. It’s safe to say that “In bloom” and “Wish You Were Here” are the album’s heavy hitters; these songs really showcase the peace and the panic within the album. “Wish You Were Here” is my favourite song on the album. It’s a soft acoustic song with gentle vocals to match and it makes you feel the peace portion of the album’s title. The band’s lead vocalist and co-lyricist Ben Barlow fit this song perfectly. I know the band wrote it and all but have you ever heard a song and just thought, wow, this is exactly what you’d expect? That’s this song. “Wish You Were Here” tells a story about losing a loved one to a car accident but the lyrics (“I can picture the times that we won’t get back”) make you feel a metric ton of emotions towards losing any kind of relationship: from friendship and heartbreak to death. “In bloom” starts off with an old-timey radio broadcast talking about an atomic bomb and the ensuing panic in the broadcaster’s voice makes you feel the second emotion of the album title: panic. Feel Something is the first album by the band Movements, released on Oct. 20, 2017. The title really suits the album. The emotion you feel while listening is real. It is truly the embodiment of ‘emo and self-loathing’. This album is, by far, my favourite album of 2017. The album opens with “Full Circle” and the chorus, “It comes in waves and I’m pulled below / it’s not subjective, it’s clinical / drown myself in the undertow of all my imbalanced chemicals” is supported by the lead vocalist, Patrick Miranda. Miranda’s every word makes you feel like you’re being told a story by your best friend. You feel as if you’ve known the person in the song your entire life. You care for them. The album’s biggest song, in my opinion, is “Daylily”. It is my all-time favourite on the album. I find at any time of the day, I can tweet the song’s chorus “I think it’s time you had a pink cloud summer” and I will be joined in by others who will continue the lyrics. This relates more to the people who follow other pop-punk fanatics, like I do. That being said, you don’t need to have Twitter to find this song the most catchy and quotable on the album. The lead vocalist, Patrick Miranda, wrote it for his girlfriend, who suffers from mental illness. She refers to her good days as “Pink Cloud days”. Miranda wishes her a “Pink Cloud Summer” as he hopes she has more than just short days of happiness. This song became my favourite when Spotify gave me the push notification of “Music I may like” the day it came out. After researching the meaning of the song, it holds an even more special place for me. Overall, 2017 was an incredible year for the genre and from the sneak peaks 2018 will be just as great. You can catch Movements live headlining their first and final Warped Tour this year on July 17, 2018.